For almost 30 years Star Wars has dominated the subject sci-fi fantasy. Many fans of the genre are quick to dismiss it while fans of the movies themselves sacrifice their own reputation by dressing as Yoda for halloween 20 years in a row. Given the success of the first three movies, A Phantom Menace had no chance of filling the requirements people placed upon it. Still, it was actually released and did very well for itself. Then we come to George Lucas. For his original statements that he would not release the original three movies until after 2006, he is one of the last remaining enemies of DVD. Next to DIVX for their oppression of an art form and Disney by exploiting children for cold hard cash, Lucas and his ego were personally responsible for the original lack of success of the format. Sure, that is all ancient history and now DVD is the number one home consumer format for movies, but it could have failed and Lucas didn't help. Still, release of the Phantom Menace just a short year and a half after the theatrical release and the quality of the DVD proves that he has embraced the format. So how is the movie? Much like everyone else said, it could have been better. There were two main problems with this movie, two things that would have made it a far better picture had they been removed. One, Jarjar. I am not even going to get too deeply into it because only about 4 billion people have the same opinion as me. It goes to show a larger problem with Lucas's philosophy for this movie. He tailored it for 5 year olds. Had he taken it as seriously as he took Empire Strikes Back, it would had been a far better movie. Jarjar is an easy icon to show that he was more interested in happy meal tie ins than making a great science fiction movie. Instead of a great movie we get fart jokes. Number two was Anakin's dialog. If you removed every line of dialog that ever came out of Anakin's mouth, the movie would be far better. I actually like the pod race scene a lot since it goes to show Anakin's skill as a pilot but he also never says a word as he repairs his pod while it is flying at close to supersonic speed. During the attack on the droid control ship, however, he won't shut up, spitting out a horror of un-funny dialog with every explosion. I am not even sure a five year old would laugh. This goes to show how childish Lucas took his own work. The movie does have all the elements of a great science fiction movie. It has a ton of depth and background. It has a good story that moves along the whole series, and good characters aside from the two mentioned above. The action is very solid except when you realize that they fight nothing but robots. I am still working on picking up my father's legacy of the Robot Protection League. Robots are people too after all, and simply using them as fodder for our heroes doesn't give them the respect they deserve. Honestly, though, beating on robots is just as much a copout as the G.I. Joe firefights that end up always turning into fistfights without a single casualty on either side. 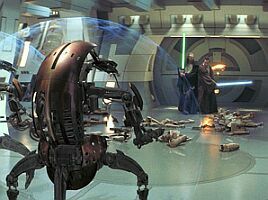 Even with the robots, the action scenes, especially the lightsabre dueling is top notch. The DVD is excellent except for the lack of a DTS soundtrack. The picture is a very clear, though a bit dark 2.35 to 1 16x9 enhanced transfer with a Dolby Digital 5.1 EX soundtrack. John William's soundtrack is done very well, and I highly recommend turning up the volume a tad higher than normal in order to get the full theatrical effect. Even on my modest sound system (lack of subwoofers mainly) I got just about the full impact of the original theatrical release. Star Wars just frankly isn't all it could be but we shouldn't dismiss it either. Sure, George Lucas is still the Adolf Hitler of sci-fi fantasy, but he did a lot for the grenre too. The DVD is a very good version of the movie and I would probably recommend it for just about anyone's library. If you can get past the kiddie stuff, it has a lot going for it.